Levy Park, redeveloped in a public/private partnership with Midway, has won a major ULI international award. 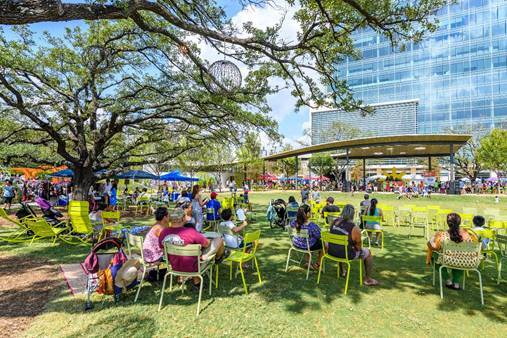 BOSTON – (Realty News Report) – Levy Park, a redeveloped park in the inner loop of Houston, has been named a winner of the Urban Land Institute’s Open Space Award, a worldwide competition. The six-acre park, located west of Kirby Drive on the south side of Richmond Avenue, opened in February 2017 after an extensive renovation. The ULI announced the awards has announced at its annual Fall Meeting Tuesday in Boston. Madrid Rio Park was a co-winner. The annual award recognizes outstanding examples of successful large- and small-scale public spaces that have socially enriched and revitalized the economies of their surrounding communities and are selected by an international jury representing different facets of development. Levy Park, which underwent a $15 million revitalization and renovation, was one of five finalists, with the others from Lynwood, California; Fall River, Massachusetts; Changsha, China; and Madrid, Spain. Lynwood’s Ricardo Lara Linear Park won for Community Impact. Upper Kirby District Executive Director Travis Younkin and Levy Park’s Park Director Stephanie Kiouses were on hand when the Urban Space Award was announced in the General Session. Chip Traseger, Design Director of the Levy Park project for OJB Landscape Architecture, was also at the conference, as was architect Natalye Appel, Natalye Appel and Associates, who was also a partner. “We are thrilled that Levy Park was chosen for this award from projects both in the United States and embraced by residents and out-of-town visitors alike for its wide array of amenities and innovative design,” says Younkin. The redeveloped Levy Park is adjacent to the new Kirby Grove office building on Richmond Avenue, just west of Kirby Drive in Houston. Levy Park is a City of Houston Park and part of the Houston Parks and Recreation Department, while operated by the Levy Park Conservancy, under the auspices of the Upper Kirby District Foundation. 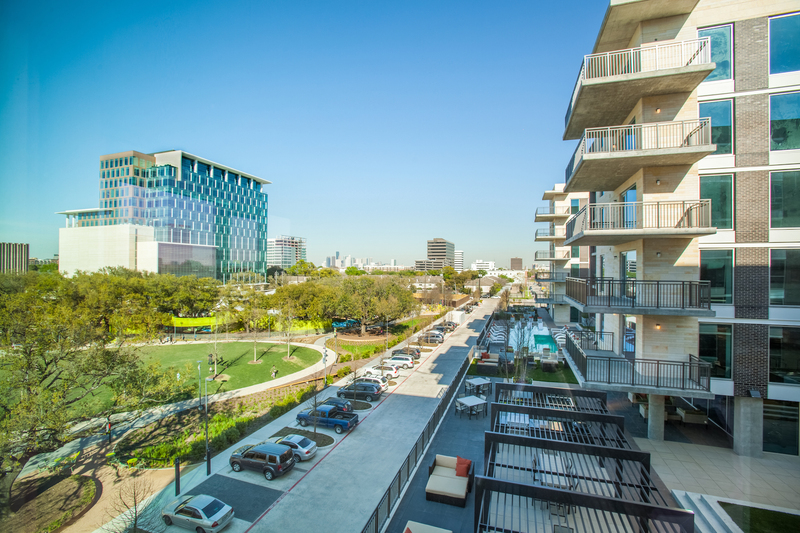 Midway, a Houston real estate firm, has developed a pair of private-sector bookends on the edge of Levy Park: the 16-story Kirby Grove office building and the Avenue Grove multifamily development. Midway has a long-term commitment to provide funds for Levy Park, which has a lot of programming and activities. OJB Landscape Architecture (OJB) was the designer for the Levy Park revitalization. This is OJB’s third urban park to be recognized by the ULI, as the firm previously won consecutive Urban Open Space Awards for Myriad Botanical Gardens in Oklahoma City (2015) and Klyde Warren Park in Dallas (2014). Built with public funds and sustained primarily by private lease agreements with the Midway Cos., the Park features activity and event lawns, performance pavilion, dog park, promenade with seating and games, community garden and rain garden, both which harvest and reuse stormwater. At the heart of Levy Park is the unique Children’s Park, which offers imaginative, interactive sculptures, playful fountains and a 150-foot-long tree house situated among several large legacy live oak trees that were relocated on-site and provide a magnificent canopy. Next: Houston Home Sales Up Year-to-Date Through Sept.